i. What Size of a Safe do I Need? ii. What Type of Lock Would be Best? iii. What Type of Material do You Want? iv. What Extra Protection Installations do You Prefer? v. Do You Prefer Some Particular Design or Look? You might own a gun for sport or just for safety purposes. Whatever might be your reason for gun possession, if you do have guns it can cause harm unnecessarily. So you need to be sure it is kept safe by any means. A gun safe, in this case, can go a long way to meet your needs to protect the firearms you own. So your home and family can be safe from any unavoidable accidents as well as it will ensure that you do not come across any liabilities if it falls into the wrong hands. There are a few critical variables, and you will find tons of options which will delude you from what you wanted to buy initially and for what reasons. Your priorities and preferences are of first importance. So we here provide you the most accurate and brief idea on best gun safes you should not miss to check out and the thorough guidelines on how you can get to choose the best among them. A gun safe can cost more than $1000 but why need to spend more when you can have only at $300 and even less. Now let’s take a look at this comprehensive guide. Before moving on you should take a look at this video why a gun safe is essential, and you probably should buy one as soon as possible. It has a laser cut seamlessly welded body with black powder coating. Inside it is fully carpeted with fully adjustable shelves. There are integrated LED lights to have a better look inside. 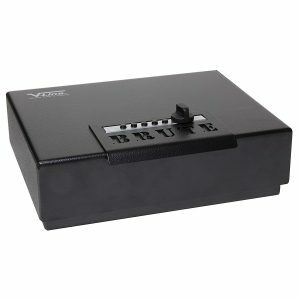 The safe has a motorized deadbolt lock system with anti prey insertion slots, digital keypad LCDs operations, and battery status. Warning beeps are available if the door is kept unlocked and opens in less than a second. The quick vault comes up with an interior of 13″ x 11.75″ x 2.5″. The trunk has a lock that needs tiny space of the interior other than other bolts which consume about one-third of the interior and so provide a lot of internal capacity. The vaults fit in between wall studs, and the recessed door which is flushed allows to conceal the safe if anything is placed over it. 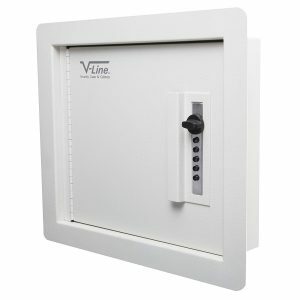 The vault fitted with anti-pry protection brackets provides extra security around the non-hinged sides of the door. The V-line offers the new BRUTE super quick access pistol box. It is an appropriate and perfect solution to keep the handguns and valuables. Its structure is built with ten-gauge steel with an overlapping lid with a virtually proof solid surface. Its surface has a black powder coating which gives a flawless look to it. The handle is made of 12-gauge steel. It has secured high-quality pistol cases. Smart and like all the V-line cases the BRUTE has five reliable push buttons for simplex locks. It has a faceplate around the bolt surrounded by a handle to prevent the lock pry. All the V-line products are made at the modern facility and straight from the USA approved from CA DOJ. The company provides the vault with extra durable black powder coating to provide tactical security. The steel made gun security is four and a half feet tall that is the best fit in any corner of your room you bed. The capacity is not bad when it holds up to eight guns at a time. More happiness to know that it separates every self for handguns, ammo, valuable documents and other accessories that demand the same security as your guns do. It includes removable selves and you will be able to process long guns inside. Just smoothly remove the self and place your long gun. This is an exceptional design that lures you to buy for guns for safe security all the way. The foam, you know the soft bed for your guns saving from using scratches. It means the shiny color of your guns that long last. The installment of the door hinges finishes welding into the steel door and the body of the safe is for more security, a satisfaction in mind that never ends. Three-point locking is a royal security, just a punishment for burglars and for naughty children around you. The resistance is good. So, the thing is good too. Double doors. More facilities in use. This is not a simple when you are looking for a best safe under 300. The new models beat the previous models providing tight security for your guns. Up to ten long guns it laps inside its well-hollowed storage. The security is guaranteed under the safe is cheap and long-lasting. Not a single and simple self is like its previous models of Stack-on family. The gun safe is designed with four stunning selves that comfortably can hold ten guns in separate self without putting any scratch on the guns. Because it padded. The most valuable documents, jewelry, pistol magazines, ammo and etc. can be stored easily inside the Stack-On GCDB-924. Four removable selves of the safe provide more advantages to keep the long guns inside. The reinforced steel is so hard that not any heavy weight-strike can bend it to break into the safe by the burglars. Three-point security shields the safe as Statesmen give for their president to protect from unwanted dangers. So, the best gun safe gifted by the Stack-On for their valued clients worldwide. The few necessary things you should know while buying a gun safe are the weight and structure of the safe, what it looks on the inside, how much space is available, how is the system of lock and do you feel it is safe after all or not. Now take a look at our suggestions. What I would suggest is that you should always buy a safe more significant than you think you need because even if you do not expect but you might end up buying some more guns. You will also keep your valuables after some time, and that need extra room too. We spend quite a lot of money on the guns or any other valuables that we want to keep safe, but we also need to spend money on the safe that these valuables are going to be kept in. When are spending money why don’t we get a bigger size? Of course, the size that can be kept in the available space in your house needs to be chosen. If you are getting the safe only for handgun protection, you can only have a key lock or just a combination lock. But if you are buying the safe for keeping other valuables that need quick access, then you can go for electric locks, keypad locks or fingerprint scanner ones just the way we get to use in our daily used smart devices. The material can be however more or less the same. The safes are usually made of steel. But we would prefer you should go for steel, not more than ten gauges. An eight gauge serves the best. For ensuring the best protection, you should check out if your safe is fire resistant or it has multiple lock systems or an alarm attached to it or electric shock facilities or not. You can have extensive options for what type of design or look you want for your safe. It can be two-storied, slide out drawers, interior shelving with woods, composite doors and more. Now the list of specifications and particulars can go on. There is no limit to custom designs. But here you get a whole idea of what necessary things you should keep in mind while buying a gun safe under 300. A gun can keep you safe from dangers, and at the same time, a weapon can become the reason for your unsafe future. You own a gun for practice, but it can turn into a matter of concern if it falls in the hands of burglars or criminals. So while you pay a lot for your hobby or necessity to own a gun, spending a little more to hold a gun safe is an essential investment for your safety. Before buying one, you should always check out the lists of what to buy and what not to buy. Following what we can lead you to better decisions I am sure. Feel free to go through our reviews and carefully extra check the product specifications you prefer. Finally, buy what best suits your need. We hope you get the best and affordable gun safe under 300.